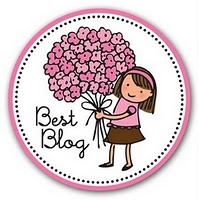 Some of the more eagle eyed of my readers might have spotted the new Best Blog badge on the right hand side of Skin Deep. Whilst I'm not normally one to go in for these types of awards, it's a real honour to have been chosen for this by a fellow blogger, Discovering Beauty. If you haven't yet checked out her site, click here to do so. It's a cute idea, similar to a modern day chain letter I guess. As part of the award, I've been asked to share some facts about myself, answer some set questions and nominate ten other blogs for the award. So, here goes..
Favourite colour? Of what? Nail polish? Lipstick? It depends! Favourite song? Too many to list! What is p*ssing you off? Nothing I'd air in public! Biggest fear? If I share it, it might happen!